I heard about this book on Morning Edition a couple of weeks ago, during one of Nancy Pearl’s chats with Steve Inskeep. Etta and Otto and Russell and James is Emma Hooper‘s debut novel, and it’s one of those books that had such buzz (it’s being published in eighteen languages right off the bat, it seems to be everywhere you look, it was starred in every major review journal in the U.S.) that I was skeptical. But it’s an incredibly good read, and unlike anything I’ve read. Etta, Otto, and Russell grow up on the prairie in Saskatchewan. Otto comes from a large family, and Russell is an only child whose father dies during the Great Depression and whose mother takes him to live with a childless aunt and uncle, neighbors of Otto’s family. He is absorbed into the mob of siblings, and he and Otto take turns going to school and tending to farm work. Etta takes a job as teacher in their one room schoolhouse, even though she’s about the same age as Otto and Russell, right about the time most men — and older boys, like Otto — are leaving for the war. When the novel opens they are in their 80’s. Otto wakes up one day and finds a note from Etta, “I’ve gone. I’ve never seen the water, so I’ve gone there. Don’t worry, I’ve left you the truck. I can walk. I will try to remember to come back. Yours (always), Etta. Beneath the letter she’s left him recipe cards, so he can eat while she’s away. The rest of the book alternates between the present, as Etta walks, and Otto tries to get by without her, and Russell gets angry that Otto hasn’t stopped her and goes looking for her, and the past, when the three were growing up, and when Otto went to war. I don’t want to give too many details away about the story. I do want to say that the movement back and forth in time and place in the narrative is seamless and I was never lost. And that Otto’s sister Winnie is as intriguing a minor character as I’ve come across in a while — even in a book full of intriguing minor characters — and I sincerely hope she is marching around in Hooper’s brain demanding a book of her own. Hooper writes beautifully, her prose is very clear but also has a musical or poetic quality. Things happen as they would in real life but also as they might in a dream. If you’ve noticed that I don’t say who James is, it’s because I think you’ll have more fun finding out for yourself. Hooper references dust often, and dust advances her narrative more than once. But what I really love about that brief passage, beyond the dust, is how much is there — you’re transported to a languid afternoon, two people in love, snug in a house with the world pressing in. So much is about to happen in their lives, but for this moment, they are content to pretend that all they have in the world is each other. At the library people often want me to tell them what a book is about. Etta and Otto and Russell and James is about what all good books are about — what it is to be human, to love and to hurt, to thrive and to suffer, to create and to deplete, to seek after the very puzzle of all of this, looking for what’s true, living as if life is a quest and the prize is knowing your own heart. This book isn’t for you if you like a neat ending to a clear-cut story. But if you want to wallow in the muddled, holy mess of life, pick up Hooper’s debut and give it a try. I order fiction for my public library and when I came across glowing reviews of the new American edition of Magnus Mills‘ novel, The Maintenance of Headway, I was struck by two thoughts: 1) no matter how much I read, and how much I follow the publishing world, there will always be wonderful authors out there I have somehow missed and 2) I really wanted to bring this author to our library collection because we don’t own any of his previous work, not even his first novel, The Restraint of Beasts, which won wide acclaim, awards, and nominations. So this weekend I read The Maintenance of Headway, which is a book told from the point of view of a double decker bus driver. The title refers to “The notion that a fixed interval between buses on a regular service can be attained and adhered to.” The narrator and his fellow drivers carry on their routes with occasional interference — or is it lubrication? — from inspectors, whose job it is to oversee the maintenance of headway and overcome the problems that arise when buses draw too close together or too far apart. Being late is acceptable, being early is not. Edward, one of the drivers, notes, “Lateness is something they know how to deal with. They can quantify it, label it, and apportion blame accordingly.” If you’re sensing an absurdist flavor you’re right — a novel about keeping buses running a certain number of minutes apart even if that means discharging passengers before the end of the route or redirecting a bus so that it heads north when it had been heading south, in the interest of the maintenance of headway, is dealing deeply with the ridiculous. And that’s what I loved about it. I enjoy dry British humor. Mills wittily magnifies the quirks and habits of the drivers, the million little factors that speed or slow a bus route (traffic lights, weather, number of passengers, even waterworks maintenance), and the way the drivers who become inspectors embrace their new power. It’s also a lovely read; the descriptions of the narrator’s view from the driver’s seat of his bus and the admiration he has for the buses and the system are somehow beautiful. I don’t know about you, but that question is one of the reasons I read. The Maintenance of Headway is a book you want to talk about as soon as you’re done reading it, a book that lingers in the mind. Look for it. Also, I hate summer reading lists, but I love Books on the Nightstand, and their summer reading bingo card seems like a fun way to try something new this summer, if that’s something you enjoy. I think I’m going to give it a go. I’d been waiting for a couple of months for Marie Kondo’s The Life-Changing Magic of Tidying Up: the Japanese Art of Decluttering and Organizing, so when it came in for me at the library on Friday, I resolved to read it this weekend and return it, because it’s in high demand. It’s a very eye-opening read, and when I poked around a bit online I found some videos of Kondo speaking and consulting in someone’s home, folding socks and underwear, and — this one strikes fear in my heart — organizing a book collection. There are also many fan videos done by people applying the KonMari method of tidying. Kondo’s KonMari tidying requires going through all of your belongings, systematically and deliberately, choosing what to keep, and designating a place for everything. This small book is packed with detailed examples to help you get started. What do I make of this phenomenon? When I finished the book I wanted very much to tidy. Kondo notes, “In essence tidying ought to be the act of restoring the balance among people, their possessions, and the house they live in.” The Computer Scientist and I have been striving for that for years. In our early 30’s we read Your Money or Your Life, and decided to be more conscious of how we wanted to spend our life energy. Eventually that meant selling everything that didn’t fit in a 26 foot U-Haul and choosing meaningful work that also allowed for more family time. Today our lives are a little busier, and we’re not always as focused as we’d like on where our life energy goes, but we live in a smaller house than we have previously. Still like everyone else, we sometimes feel overwhelmed by stuff accumulating, and end up going through the garage, or a closet, or some cabinets, just about annually. We always wonder how that happens. Kondo says that if you apply the KonMari method thoroughly, you’ll change the way you relate to things altogether, and will learn to “see quite clearly what you need in life, and what you don’t. . . .” First of all she says you shouldn’t just do a closet or even a room at a time. Also, she suggests tidying things most of us would never think of getting rid of — documents, for example, and mementos, which she says most people never look at. Which sounds like a “first world problem,” and it is. But she’s hit a real nerve, as the popularity of her book (which is a bestseller in several countries) and her YouTube videos can attest. A mind-shift like Kondo describes is very appealing, “If we acknowledge our attachment to the past and our fears for the future by honestly looking at our possessions, we will be able to see what is really important to us.” That’s a kind of “mindfulness of stuff,” that seems very healthy. The Computer Scientist and I are intrigued to say the least, although her “ikki ni” or “in one go” house-wide approach sounds like it would require us to take vacation time to manage it. I was working at the circulation desk and saw this book come back. I decided it was a must read. It’s very short and small (only a little bigger than a 4×6 notecard), and the illustrations of the cats are wonderful. 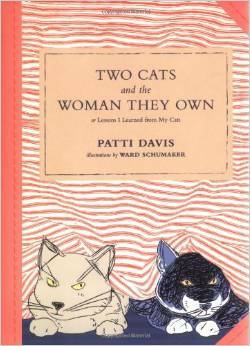 Each little chapter is a story about Patti Davis‘s cats, Aretha and Skeeter, followed by a “life lesson.” For example, Skeeter attracts the attentions of an cat named Lucas who shows his affections by spraying in Davis’s apartment, so as she notes, “Skeeter’s romance became a very smelly affair.” The life lesson for that chapter is “We can’t choose our family members’ friends. Sometimes we don’t understand those relationships, but tolerance is important.” The text and art are perfectly complementary — I love the patterns in the fabrics Ward Schumaker includes, the bright colors and bold lines. A thoughtful little book. I was having one of those evenings when everything I picked up to read felt wrong. I’m not usually a fan of e-books but I turned to downloading a library book because it seemed like a decent way to browse a greater selection than my “to read” pile on short notice. The book I ended up with was Me Before You by Jojo Moyes. It happens to be the second British novel I’ve read in the last couple of years that addresses euthanasia, the other being The Universe Versus Alex Woods, by Gavin Extence, which I loved. And I loved this one, too. Not necessarily because of the topic (in either case) but because of the terrific characters and excellent storytelling (in both). Both books give props to the characters’ local library, which is always nice. Me Before You is about Will Traynor, a successful, wealthy man whose was paralyzed in an accident, and Louisa Clark, a woman whose life experience has been limited in part because she’s never been led to believe it could be anything else. The cafe where she works closes, and after a few week’s searching, Lou finds herself working as Will’s carer even though she has no experience. She’s afraid of Will’s imposing mother, a magistrate, and of Will himself, both because of his disability, which she knows nothing about, and his attitude, which is scornful. But she and her family really need her salary, and her other options are grim — the job center offered chicken processing or exotic dancing — so she is determined to figure it out. It turns out Will’s got plenty of medical care, and that his mother hired Lou despite her inexperience because she hopes Lou can get through to her son, who can’t see any hope as a quadriplegic and doesn’t want to live. Lou says what’s on her mind, and can’t hide her emotions. She works hard to figure out how to get along with Will, who is at turns sarcastic and withdrawn. At 27, Louisa has never left home, hasn’t traveled much, but has a lot going on in her life. Her boyfriend has become obsessed with running, her mother stays home to care for her grandfather who’s had a stroke, her father is constantly worried about being “made redundant” (laid off) and her younger sister Trina always outshines Lou, even in messing up her life. Lou’s whole family make trenchant remarks about her limitations, but they need her pay. You can guess, somewhat, where this is leading. The unlikely pair, thrown together by life’s circumstances, cue surging violin music. But Moyes makes it much more interesting than that. I especially love the way she writes about her characters. They’re real, messy, complicated people, and Moyes makes it clear that both the Traynors and the Clarks, who live on opposite sides of the town’s castle, have their ups and downs and difficult family dynamics. Moyes keeps the story fresh and right up to the end I wasn’t positive what would happen. And, I was actually weeping — not just tearing up a bit — but I didn’t feel manipulated. Me Before You isn’t a sob story. It’s just a beautiful book about people who are wholly human, who have to figure out how to do the best they can.